* Progressive Access means upgrading from an existing entitlement to the next available level. If you are applying for your first learner permit you must include a theory test certificate along with your learner-permit application. Note that these theory test certs have a ‘lifespan’ of two years from date of issue, so you must apply for the Learner Permit within two years of date of issue of the theory test certificate. Vehicles in categories AM, A1, A2 and A (motorcycles and mopeds) must also display L plates at all times. 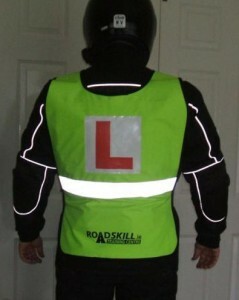 The plates must be displayed on a yellow fluorescent tabard worn over the person’s outside clothing. The letter L should be at least 15cm high and appear as red on a white background and in clearly visible vertical positions to the front and rear of the person’s body.